The photo club's assignment this month is HDR so I was looking to experiment with some processing techniques. 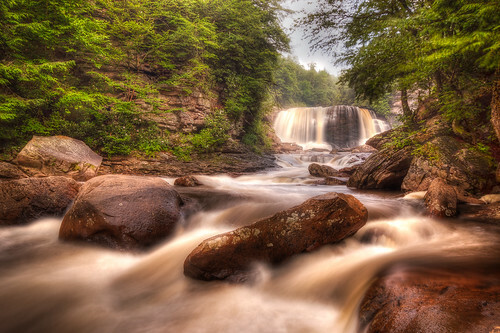 In addition, I'm thinking about going back to Blackwater Falls this coming weekend so I went back through shots from my last trip for planning. I never processes this shot from last year and I had taken it bracketed (with 4 exposures) so I figured why not work on the assignment. I pushed this further than I usually do to see what I could pull from it. At first I was coming up with too many distracting artifacts and not enough depth. It was just after sunrise and a heavy blanket of fog was starting to burn off, so there was a weird mixture of light. I decided to aim for a dreamy quality in the processing to see how it would look. A lot of the depth in the water color is not so much from the processing as it is from the water itself. There's a reason this place is called Blackwater.